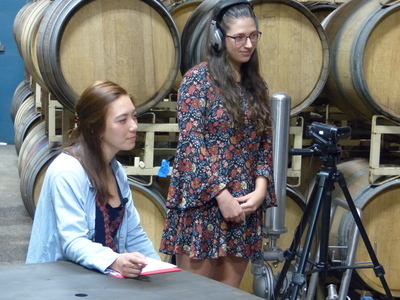 Linfield College Archives students Camille Weber and Jordan Hitchcock are photographed during an oral history interview with Harry and Wynne Peterson-Nedry at Chehalem Winery in Newberg, Oregon on April 15, 2016. Linfield College Archives, "Harry and Wynne Peterson-Nedry Interview 02" (2016). Browse All Willamette Valley Oral History Interview Photos. Image. Submission 110.